Whitney Jennings drives to the basket. Jennings tallied a game-hough 15 points before fouling out in the fourth quarter. Jimmy Lafakis/Collegian file photo. 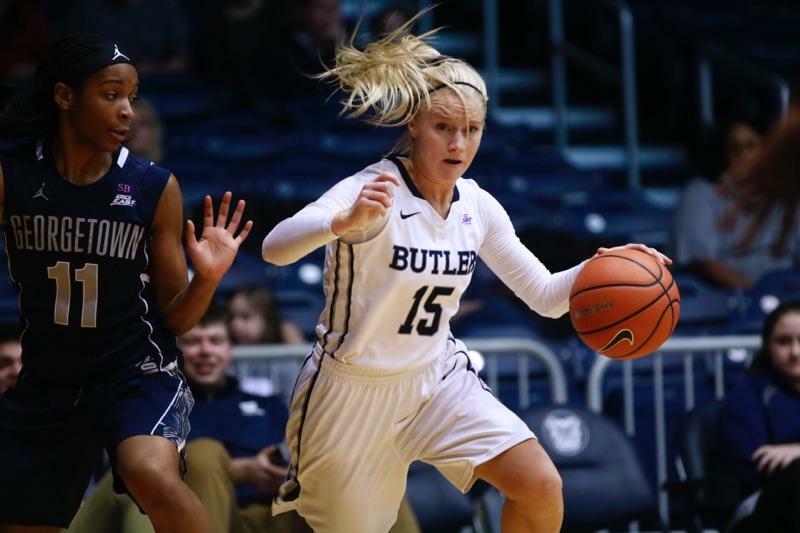 The Butler University women’s basketball team finished Big East play with a 57-54 road loss to Xavier University on Feb. 25. The Bulldogs finished the regular season with a 6-12 conference record and 14-16 overall mark. Butler trailed Xavier for most of the first quarter, but the two teams remained close and the Bulldogs were able to tie up the game at 16 heading into the second quarter. The Bulldogs took the lead briefly early in the second quarter, but Xavier quickly reclaimed it and grew as much as an eight-point lead before Butler went on a 7-0 run to end the first half down by just one point. Butler outpaced Xavier 12-10 in a third quarter that featured five lead changes to take a one-point lead into the final ten minutes of play. Xavier quickly regained the lead, which the Musketeers held for the remainder of the game. Butler had the ball down by three points with 13 seconds remaining, but multiple 3-point attempts fell short and Xavier came away with the victory. Redshirt junior guard Whitney Jennings posted a game-high 15 points before fouling out late in the fourth quarter. Sophomore guard Kristen Spolyar finished second on the team with 12 points, while junior center Tori Schickel tallied 10 points and seven rebounds. Junior guard Michelle Weaver scored nine points, while graduate student guard Iman Lathan collected six points, seven rebounds, and three assists. Butler actually outshot Xavier from the field 40 to 31 percent for the game, but the Musketeers converted seven 3-pointers compared to just three from the Bulldogs. Xavier also edged Butler in rebounding 37-36. The Bulldogs will now move on to the Big East tournament, where they’ll start play as the eight-seed in a first round matchup against ninth-seeded Providence College on Saturday, March 3. That game, at Wintrust Arena in Chicago, will be broadcast on the Big East Digital Network. Butler defeated Providence in both of their prior matchups this season.